Mini Golf Sydney .. The Best Mini Golf Facility! We have 2 eighteen hole mini golf (or putt putt) courses to choose from – Palms and Billabong. The mini golf courses wind their way along side rivers, across bridges, past ponds and waterfalls. A great test of gross motor skills, concentration and movement! Mini golf, sometimes known as Putt Putt, has long been a favourite activity for people of all ages as well as a great family pastime. Our mini golf courses have been designed to ensure that players of all ages with varying skill levels will have a great experience – and have a ball at the same time! Thornleigh Mini Golf is open 7 days a week, day and night. Complimented by our Bunker Cafe and several dedicated function areas, Thornleigh mini golf is the ideal location in Sydney for mini golf, birthday parties and Corporate Golf Days. 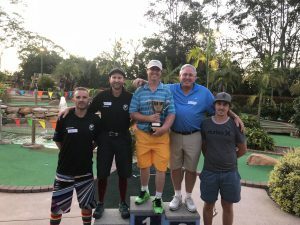 Thornleigh mini golf in Sydney is also a great group activity and is an ideal venue for large groups to visit during the day or in the evening. We also offer discount rates for group bookings so please don’t hesitate to contact us. The combination of mini golf, the bunker cafe & golf driving range make Thornleigh Golf Centre one of Sydney’s ideal locations for Group activities. The minimum number for a Group Booking is 10. If your group is smaller than this then there is no need to book, just turn up and play. Note: Lights out promptly at close time. Thornleigh Golf Centre recently had a visit from Australia’s reigning Putt Putt King – Allan Cox. He played the Palms and Billabong mini golf courses and loved them! Watch Allan scoring a hole in one on every hole! Who said it was a tough course.